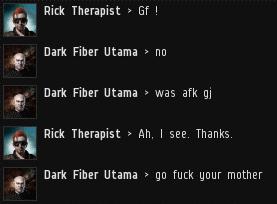 Highsec miners can sometimes have a complicated relationship with those who gank them. It would be easy to make sweeping generalizations about the miners, but all of the subtleties and complexities of the highsec carebear are explored, in depth, right here on MinerBumping.com. On second thought, they're fairly simple creatures. This past month saw an uptick in the number of carebears directing their insults at our Agents' mothers. In most countries, Mother's Day is celebrated in May, so that could explain it. 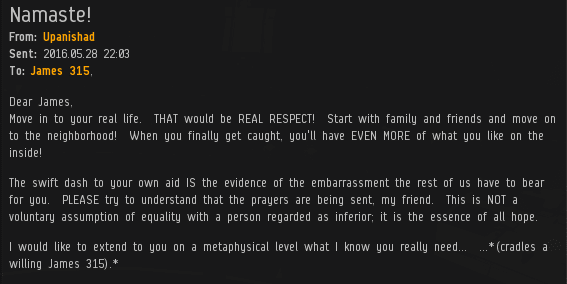 On that note, Agent Galaxy Chicken reported a new excuse being used in highsec: "Don't gank me, I'm a single mother." In fact, the New Order doesn't discriminate against single mothers. 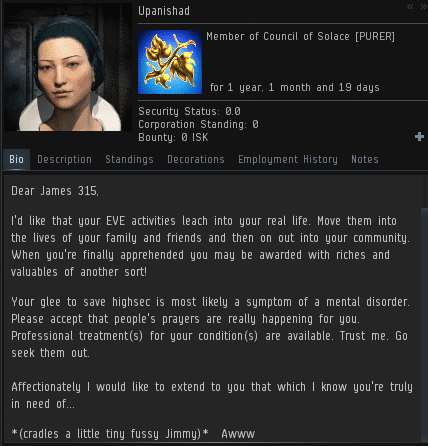 We have enough respect for all EVE players to consider them capable of meeting their obligations under the Code. Which is exactly the kind of equal treatment that most single mothers want, probably. Imagine if you'd never heard of me or the New Order, and you saw someone with a bio like this. It would make for puzzling reading. On the other hand, if you've played EVE and don't have at least a little familiarity with the Saviour of Highsec, you must be a bot-aspirant. Apparently, somewhere along the line, MinerBumping ended up on the same list as "The Satanic Verses". If you believe Tariq ibn-Ziyad, that is. Agent Salah ad-Din al-Jawahiri would tell you a different story. Slix313 was greatly displeased after Agent Semtex Attor explained why the autopiloter lost his ship. Listening to these carebear's complaints, you'd think they prefer a mystery. Semtex played the James 315 card at just the right moment. Argument won. Slix313 went from "I don't live in highsec" to "I'm a powerless highsec hauler" in no time at all. If carebears were as slippery and evasive in space as they are in conversation, they'd lose fewer ships. Our Agents move quickly. They're the best salesmen and women in highsec. Granted, they've got an absolutely fantastic product to sell. Still impressive, though. 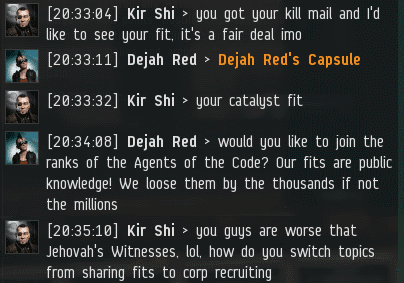 A carebear's attitude seemingly changes mid-EVEmail. Each day, the Code settles deeper into the hearts and minds of the people of highsec. Agent Revis Owen was so impressive that he induced a mining corporation to pay for permits, even as it was chased into lowsec. Why was he able to do this? Because the Code is the most persuasive work of literature ever written about EVE. Apparently, somewhere along the line, MinerBumping ended up on the same list as "The Satanic Verses". A story for the grandkids! Grandkids anon, thank you for visiting our blog multiple times per day to find stories to read to your grandkids. Please don't forget to read them the code three times a day. Not too long for you to Read? GREAT! Would you please tell me what type of words, the highsec would want to use in the main book creation? The bestessay.education review regarding the previus conversation on their responsibilities and their ways of getting connected with the activities. There are many options to make an advanced environment where the people would like to watch the highsec miner.